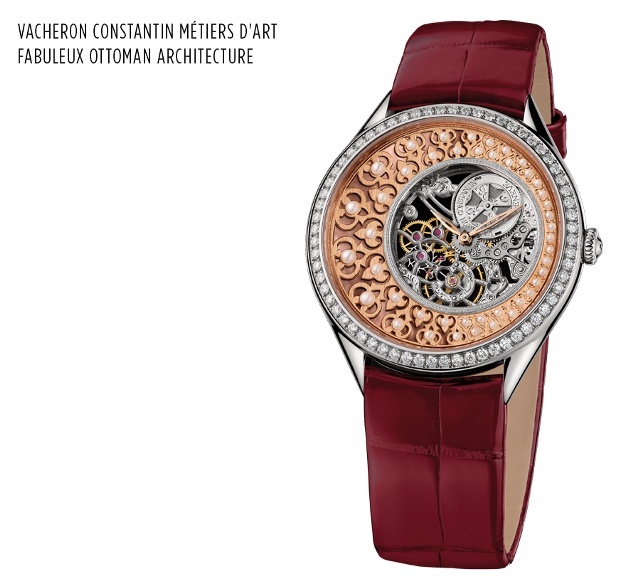 Two years since they debuted, this handcrafted artisanal collection, Métiers d’Art adds four new models in 2016. 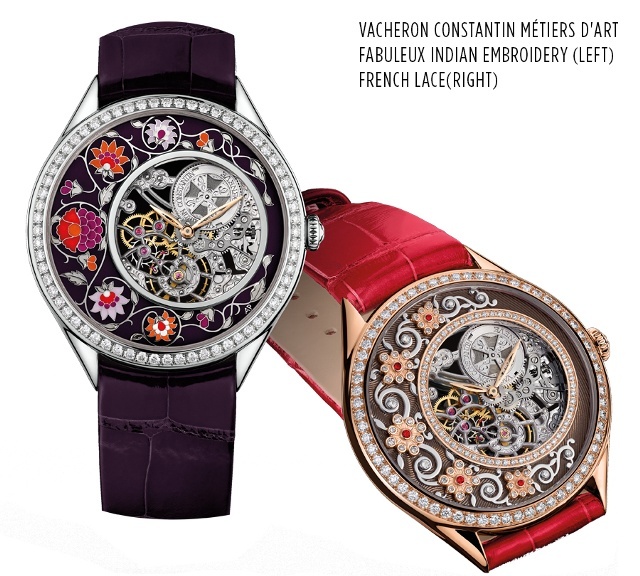 Each example focuses the eye on its openworked dial and various artistic crafts. Ten different master artisans have reinterpreted Ottoman architecture, Chinese embroidery, Indian manuscripts and French lacework. One model, called Indian Manuscript, is created from the alliance of Grand Feu champlevé enameling and hand engraving. The Ottoman Architecture timepiece features hand chamfering, natural white mother-of-pearl base and a gold grid work studded with half-pearl beads. The French Lacework model is adorned with a translucent hand-guilloché Grand Feu-enamel dial. 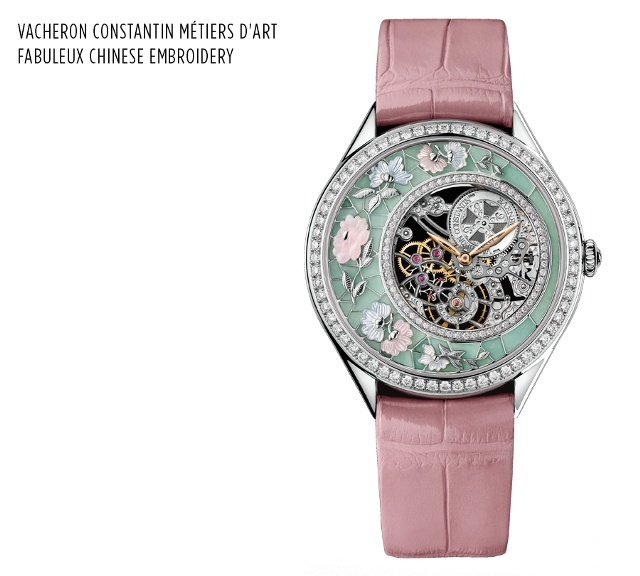 The fourth timepiece, called Chinese Embroidery, is made in pink gold and jade using the cloisonné technique. Artisans have sculpted its dial from mother-of-pearl with a glyptic-shaped pink opal along with hand-engraved gold leaves and pistils. 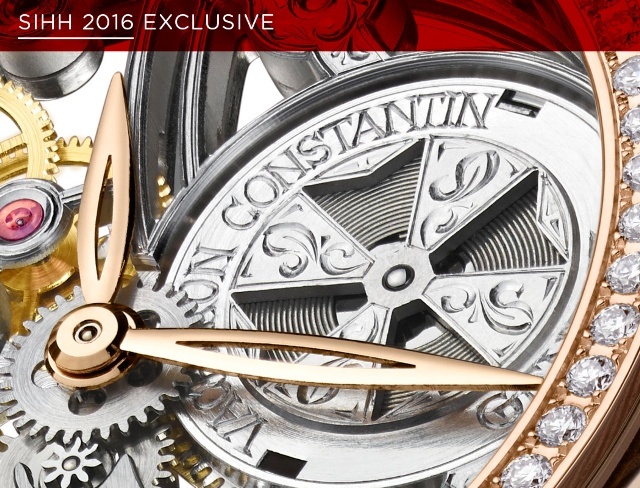 Inside each is a hand engraved example of ultra-thin Caliber 1003 made in 18-karat gold. These 37mm pink or white gold watches will be made in twenty examples each and will be available only at Vacheron Constantin boutiques. Grand Feu champlevé enameling and hand-engraving. Purple mother-of-pearl under an openworked 18-karat pink gold plate, hand-chamfered and adorned with applied half-pearls.